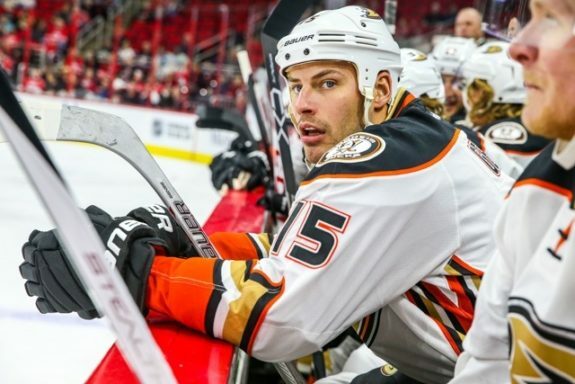 When Anaheim Ducks captain Ryan Getzlaf took a puck to his face shortly after the opening faceoff against the Carolina Hurricanes at PNC Arena on Oct. 29, there were a number of possible scenarios in play regarding severity. Unfortunately—but consistent with the story of this young season for the Ducks—the prognosis that has come out is one of the worst-case scenarios. While Getzlaf briefly returned to the ice in that game against the Hurricanes, he ultimately left and has not played since. Over a week later, the verdict has finally come out. General manager Bob Murray revealed that Getzlaf suffered a fractured cheekbone that required surgery. He could miss up to two months of action. NEWS: Executive VP/GM Bob Murray said Ryan Getzlaf had surgery to repair a fracture to his zygomatic bone. Recovery could be up to 2 months. Murray also said that one of Getzlaf’s bones was displaced, and that he will have to wear a face shield “for a while” when he returns. “One of [the bones] was displaced so he had to have it fixed,” Murray said on Tuesday. “It could be up to two months. We’re hoping it’s not that. It could be. That’s the worst-case scenario. Getzlaf is one of the few NHL players who does not wear a visor, so perhaps that will become a permanent fixture for him even after the special face shield is no longer required. For Anaheim, this must seem like some type of cruel joke. The team is already enduring the long-term absences of Cam Fowler, Ryan Kesler, and Patrick Eaves—and has also seen a litany of other players miss time earlier this season—so the absence of Getzlaf hurts even more than it normally would. It’s another obstacle to navigate in what has been a trying season just one month in. Without being equipped with their usual depth up front this season, the Ducks have had to rely on fill-in players like Derek Grant while other regulars like Andrew Cogliano have had to elevate their roles. While those players have performed admirably for the Ducks—keeping them afloat with a 6-6-3 record to this point—the team likely cannot sustain the requisite offensive production without Getzlaf and the other sidelined players over the long haul to realistically contend for the Stanley Cup. 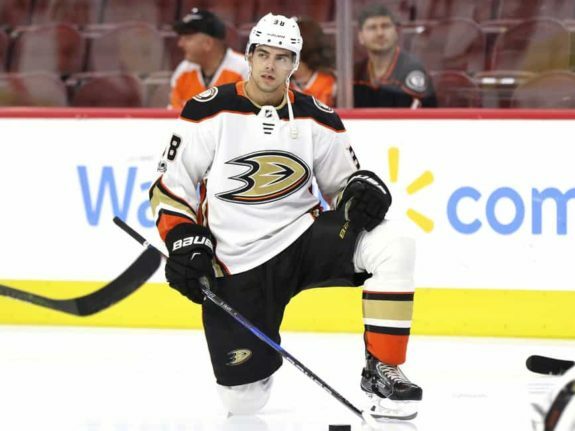 Getting back to Getzlaf specifically, besides the much-beloved sports intangibles of leadership, experience, and a strong locker-room presence, the 32-year-old career-long Duck still plays at a high level and is one of the game’s elite playmakers. The club’s first-line center, he led the Ducks with 73 points (on the strength of 58 assists) last season and then really stepped up in the playoffs, adding another 19 points (eight goals and 11 assists) in 17 games. This season, while having only appeared in six games because of other short-term injuries before this latest setback, Getzlaf was also his productive self, netting a goal and six assists. At this point, the Ducks need to stay in the playoff picture or at least within striking distance and then hope that they are back to essentially full health by early to mid-January (with the exception of Eaves, who was diagnosed with Guillain–Barré syndrome in late October). At that point, they will hopefully be able to play at a high enough level to get into the playoffs, at which point they will be a team no one wants to see if they are indeed healthy and playing to the level they typically have over the past five division-winning seasons. While the Ducks ultimately want to thrive and challenge for the Stanley Cup this season, right now, they just need to survive.